The capacity building programme runs from April 15 to 19. He said the global recession had adversely affected so many enterprises and the worst affected are the MSMEs. He said the challenge should serve as the catalyst to spur innovative enterprises that will translate into strong presence not just in our domestic market but also in the international competitive market. Radda who was represented by Mr Ibrahim Abdumalik, Enterprises Development and Promotion, SMEDAN said that training aims to curtail the mortality of small businesses. “The MSME is for sure the most viable instrument for diversifying our economy and tapping into the rich but largely dormant resource deposits across the length and breadth of Nigeria. “The stiff competition in the global markets have tended to further stifle the operations and growth of our domestic MSMEs that can rightly be classified as ‘endangered species’. “The fatalistic state of the majority of these enterprises is as a result of either environmental or endogenous constraints. “This intervention is essentially to reinforce my Agency’s commitment towards ensuring the easing of the harsh operating environment especially for MSMEs,” Radda said. Also, Speaking, Ms Chibuzo Osuoha, a Deputy Director at SMEDAN who is a resource person at the training, the programme is currently ongoing in Bayelsa, Ogun, and Kaduna. 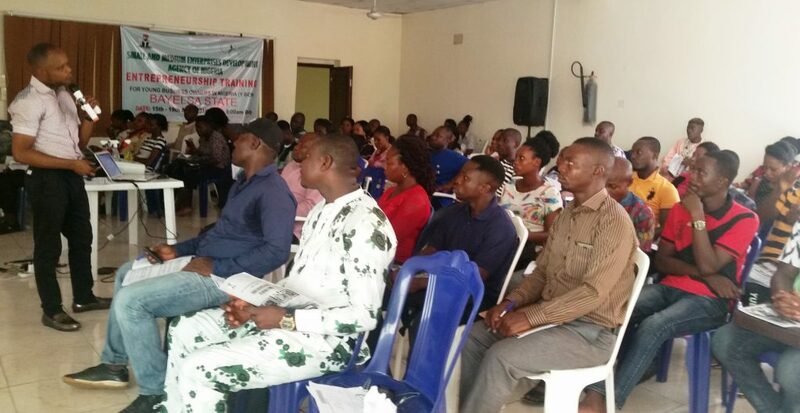 According to her, the training was packages to address the problems identified by SMEDAN leading to the failure of small businesses to reduce the mortality rate of small busineeses. “We have taken time to groom young businesses and we notices some deficiencies and lapses, so we created a curriculum that would enhance their management skills,” Osuoha said. She explained that beneficiaries were selected and put through a sensitization programme before the five day training on how to manage small businesses profitably. She said that the 104 beneficiaries who run existing businesses were grouped into two groups and would be assisted with a grant for operational space for one year. Mr Chris James, one of the beneficiaries applauded SMEDAN for the capacity building and said the training had opened him to new ideas. “The sessions so far are so interesting, and will help us to remain in business profitably, and they nuggets from the resource persons are very useful. “I believe it will take care of business failures and make young businesses to thrive,” James said.